The twin train derailments that occurred on the 28 and 29 August, 2009 outside Yaoundé has raised concerns over the ageing railway network in Cameroon. In less than 48 hours this weekend, four different trains derailed. Three cargo trains and a passenger train. The last train derailed in Obala some 30kms from Yaoundé Sunday August 30. Two days earlier a fuel-carrying train derailed at Obobogo. Two died and atleast 5 more were wounded. Explosions and fires that burned over 3hours threatened homes along the rail track, reminiscent of the 1998 Nsam fire disaster, when hundreds were killed. The Cameroon Railway Corporation, CAMRAIL, is investigating the latest incidents, but it is evident the network is outdated. A train driver, who requested anonymity, explained that “the crash of last Saturday is certainly due to the poor state of our very old trains”. “The locomotives are old, the rail tracks are also very old. 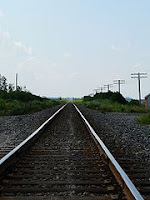 Look at the wooden railroad ties they are cracking and rotting”. The train driver said “since the French business magnate Group Bollore took over the railway, they have not bought any new equipment or maintained the rail track as promised”, he observed regretfully. Speaking on national radio today, the Board Chairman of CAMRAIL, Hamadou Sali said “our trains are not old and our equipment is good”. Ndgetchou Odile, a lady who runs a business next to the Obobogo crossing point in Yaoundé, where the Friday train derailed said “the cargo train that crossed at 7a.m. broke the rail. I alerted the railway guard Eric. Moments later a few more trains crossed before this one derailed”. Mr. Tchiroma firmly excluded the idea of sabotage, observing that “from my experience as a former railway worker, I say this cannot be sabotage, because in both cases, the locomotive did not go down with the wagons, only the middle or back of the train derailed. If it was sabotage, the whole train should derail”. It is worth noting that the board members of CAMRAIL were travelling first class, on the train that derailed Saturday, the deadliest. Overcrowding is also a very common practice in train travel in Cameroon. Sometimes 4 persons are sold tickets for the same seat in a wagon. “The passenger wagons designed to carry 80 persons per carriage, sitting, and about 34 standing usually carry over 250 persons each” the train driver says. The minister of communications insists that “overcrowding cannot cause a train to derail”. He argued that “it is only if a cargo train is overloaded that derailment can occur, a passenger train cannot be too heavy to travel”. Now that is such a tragic accident. If I were to ride a train, of course I wouldn't like to be in one that is over crowded, also I wouldn't like to be in one who's transporting materials without their workers having the right TDG training.